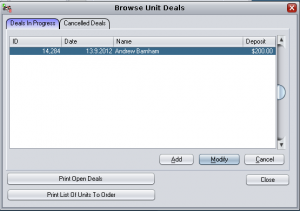 Unit Deals is a piece of functionality added in version 4.314 of c9 that allows you to build up a unit sale over a period of time, as a purchase order. The intent of deals is to simplify the process of managing unit sales, purchases and tradeins by making the process more intuitive and more forgiving. Prior process for selling a unit in c9 required keying in all data in one sitting. Unit sales can be complicated animals, and expecting a user to key in everything correctly on the spot is something of a task. The deal main screen lists all deals currently in progress. Use [add sell]/[add purchase] to add a unit to sell/unit to purchase respectively. 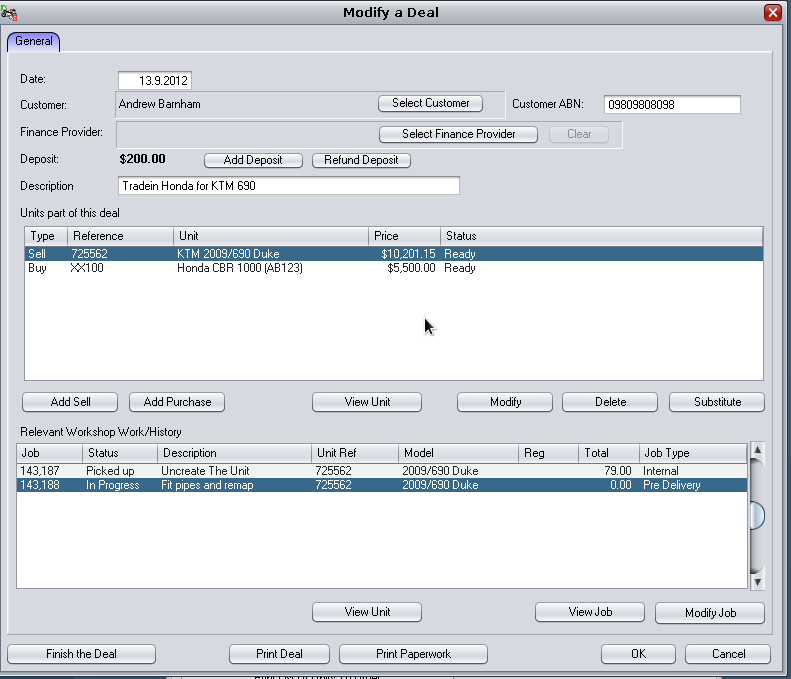 Add will open up a window to add a unit exactly same as prior sell/purchase/tradein screens. [View Unit] will view the unit as it appears currently on the database. The 'view' will show unit as it currently is on the floor (for a unit being sold) and on the customer (for a unit being purchased). View does not show you changes and deal information; only current details on the unit. [View/Modify Job] Access same job functions as you can access via workshop. When you add a unit to sell, there is the ability to add a unit that is not on the floor. So you can build a deal involving units you have not yet purchased from the supplier. 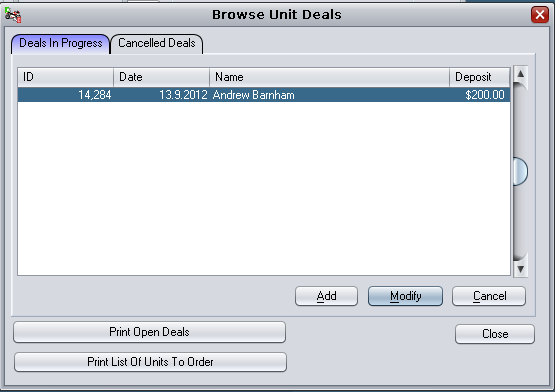 When you click on [Add Unit] click on Cancel when list of floor units is displayed. You can then type in vital details of the unit to sell. After adding such a unit, in main modify screen they will appear with red text and description 'On Order'. You cannot finalize a deal with on order units. In order to move unit off 'on order', you first receive the unit onto the floor as you would normally via Sell -> Purchase. Once on the floor, via modify deal select [Substitute] option. You can then substitute the unit on order with the received unit on the floor and then proceed to finalize the deal. Deals provide a way to manage spare part lifecycle similar to workshop jobs. On a unit on a deal; spare parts can be sold and ordered for that unit. Ordered parts, upon receive order will automatically update the deal and print details of the affected deal on the receive sheet. Additionally a deal has a concept of tracking whether parts have been actually invoiced to the deal or simply flagged to be invoiced, but not yet sold out. When you finish editing a unit on a deal that has blue line items (to be invoiced) you are presented with following window. You can invoice now and parts will be automatically ordered/invoiced to the deal. Modify the unit on the deal again and go to finish the modification without making changes. 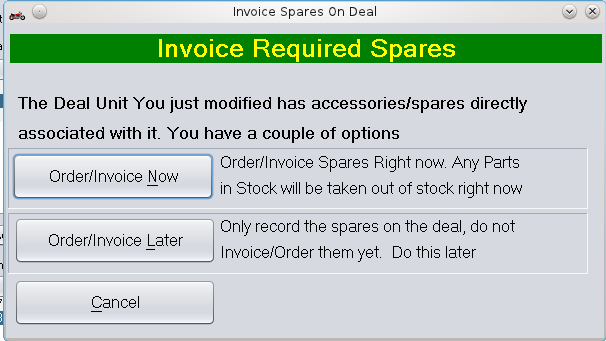 The system will reask the question if you want to invoice/order parts now or later. Finalize the deal. Any un invoiced parts will be invoiced then. Option 1) is recommended to cope with receiving ordered parts. Deals are designed to cope with waiting for parts on order; but invoiced sales are not. On receiving a spares order involving parts on a deal the receive print out will list parts to supply to deals. When you delete items off a deal unit, or delete a unit, or cancel a deal c9 will prompt you to restock items invoiced to the deal. Similar to how workshop behaves in these situations. Another level of sophistication associated with deals on sale is the pre-existing ability to flag service jobs as pre-delivery jobs. 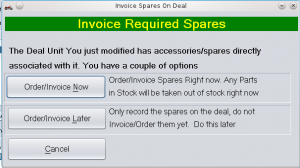 The items on a pre-delivery job automatically copy onto and update as items on a unit deal whenever the deal unit is accessed. So changes to pre-delivery job affect line items on the deal more or less automatically. When manipulating line items on a unit that are inherited from a pre delivery job you have a couple of options. Items inherited from pre-delivery jobs are color coded. One last point on line items on units. For purchased units there is a new line item type. Liability. A liability models an cost or financial encumbrance on a unit you are buying . For example you are buying a tradein unit and the customer has not paid out the finance on that unit. Part of the deal is that you will pay the finance on the purchased unit. Liabilities entered are converted into unit costs on purchase and affect profit on purchased unit when it is subsequently sold. Liabilities funcionally are same as 'on road costs' on purchase units. The item is recorded as a cost on the floor unit to the dealership. Liabilities are just more obvious intuitive naming.